Red and yellow Lebanon Pigeons with mirror wings and white tail bar fascinate pigeon lovers through the intensive colour and the colour contrast. The colour is also found in Rzhew Ribbon Tailed Tumblers, Tula Tumblers, Volga Tumblers and some other breeds. Also from genetics they are interesting. 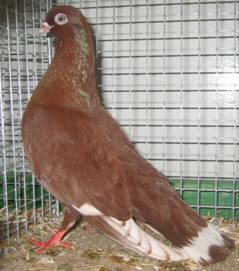 W. F. Hollander has shown that the Lebanon Pigeons are not recessive red, but genetically dominant red with a dark check pattern (velvet). 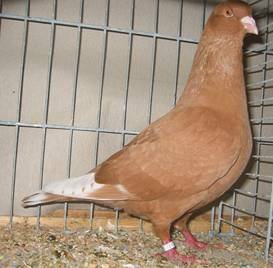 The recessive red would damage the coloration. In addition, however, additional colour-intensifying factors such as kite bronze are considered necessary to achieve the intensive coloration. He suspected that there might be different modifiers in different breeds. 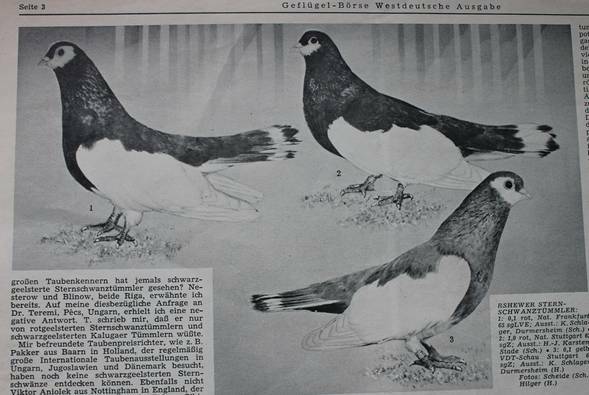 The transfer of the white tail bar on black pigeons is not possible. This has shown several attempts for Rzhev Ribbontails. After crossbreeding in the own loft, some of the reds from the following generations showed the white tail bar, however, none of those with a black color. In reports that claim the opposite, crosses were made with satinettes and blondinettes with the factor 'Frill Stencil' of the Oriental Owls. 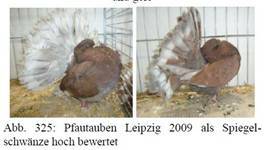 Thus Rolf Pikhart=Halle had developed some with the bluette-tail marking (Karsten 1967). Many Fantails at the exhibitions shown as mirror-tails are far from the colour intensity of the Lebanon pigeons. They have the modifier to whiten the tail bar in dominant reds. However, the tail bar is not white, and in addition the tail feathers lacks colour-intensifying factors. Such 'mirror tails' can also be obtained without crossing with Lebanon pigeons by selecting dominant red. Still without selection they often occur in German red Beauty Homers (velvets). Joe Quinn (1971, p.79) has listed the factor Lebanon bronze in the treatment of the bronze factors. Lebanon bronze darkens in crosses with the wild type and triggers a tinge of bronze. In dominant reds (velvets), there are lightening of the mirrors in wings and tail. Paul Gibson had suggested that there was no factor in Lebanon bronze and other bronze factors could take over the part. First, an assertion that other factors could take over the part does not mean that the factor does not exist. Whether it produces identical or similar effects is still an open question. 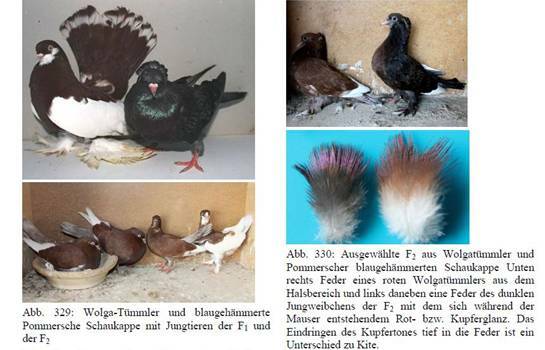 Crossbreeding of a Volga Tumbler with a blue-check hen confirmed that it was a dark check dominant red lacking the colour spreading factor, as in the case of the Lebanon pigeons and Rzhew star-tails. The colour intensity of the F1 has decreased dramatically compared to the Volga Tumbler, the tail colour is ashen and not red. In the F2, there were some dark check hens similar to English Short Faced kites. It is worth mentioning how deeply some of the copper luster penetrated the spring (Fig. 6 at the right). It cannot come from the blue check mother, it must have come from the Volga Tumbler. None of the red ones with an acceptable mirror tail, which in most of them failed because of the ashen colour of the tail. 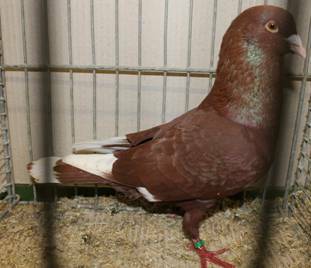 In a further mating with a hen with Gimpel pigeon background (some generations back) in the F1 some red with bluish brightened tail band and in the F2 also some intense red with almost white tail bar. Here are the darken effects attributed to Quinn's Lebanon Bronze and the whitening effect, whether it is one factor or several, that is open. For practical purposes, the reports from the fancy and own experiments show that the phenotype in backcrosses to Leanon or Startail Tumblers in some of the youngsters is well established. Splitting in the F2 will be less successful, but that is typical of those phenomena where multiple recessive genetic factors have to work together. Gibson has come to similar phenomena by combining the essential components from other breeds. 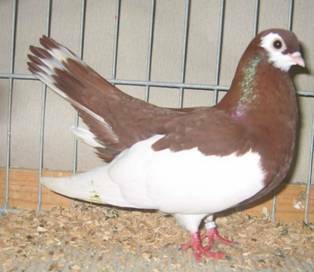 Concrete he transferred the dominant red color to the dark kites of Brander breed and thus combined dominant red, the dark checker pattern, a bronze trait and the absence of Spread.